Scott is an experienced Musculoskeletal Physiotherapist with over 11 years of clinical experience, who also has a degree in Sport & Exercise Science. He is a keen distance runner with a special interest in the management of running related injuries & is recognised as a ‘Super Specialist’ by Blaise Dubois’ world-renowned Running Clinic. Scott worked in a multi-disciplinary Sports Medicine Clinic, under the guidance of Consultant Podiatric Surgeon, Mr Trevor Prior & was responsible for establishing a Physiotherapy Running Gait Clinic. Here Scott developed a keen interest in lower limb biomechanics, which led him to complete an MSc module at London Southbank University in Advanced Neuromusculoskeletal Management of the Foot & Ankle. He has served on the executive committee of the Association of Foot & Ankle Physiotherapists, as well as the Association of Chartered Physiotherapists with an interest in Orthopaedic Medicine & Injection Therapy. Scott continues to work part-time at a large teaching Hospital in Surrey in an Extended Scope Physiotherapy role as a member of the Musculoskeletal Clinical Assessment & Treatment Service (MCATS). In this role, he works closely with orthopaedic surgeons, largely in a diagnostic capacity to help plan the most appropriate treatment for patients. 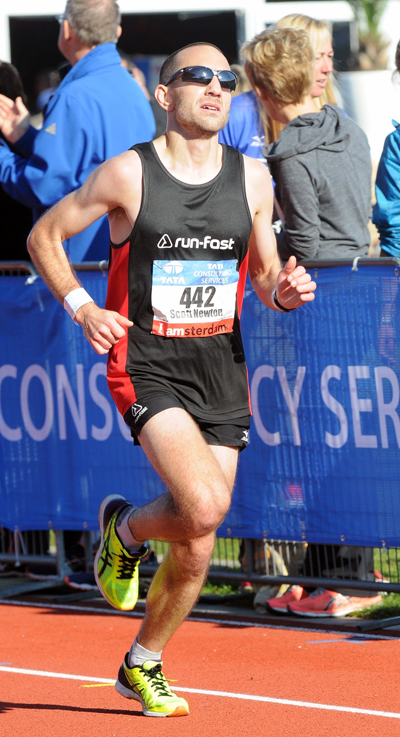 Scott consults privately 3 days per week at The Run-Fast Sports Clinic & at Complete Physio, both in the City of London, where he leads the Running Clinic. He has a 10km PB of 33 minutes, a half-marathon PB of 1:15 and a marathon PB of 2:37, all of which he hopes to improve upon!